8th Note Necklace – Add a little bit of bling to any outfit with this gorgeous 8th Note Necklace! Beautifully crafted from Rhodium, this high quality necklace has encrusted clear rhinestones along the entire body of the music note. The delicate 9″ chain features a lobster claw clasp guaranteeing that the pendant will stay secure around the neck. Anyone with passion for both music and fashion will love this stunning piece! 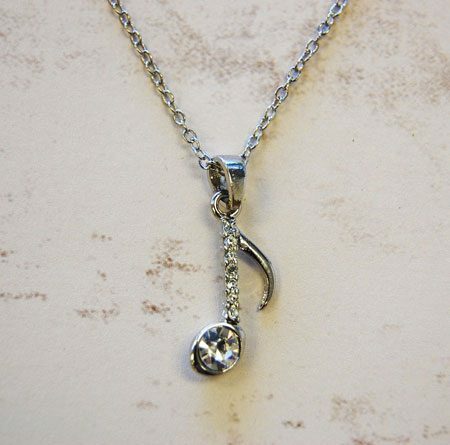 Pendant is 1.25″ L.
Also check out the Treble Clef Necklace!